Cost control in any restaurant or food service operation is highly focused on the two prime costs: cost of goods sold and direct labor. While the control of perishable stock requires considerable analysis, labor costs can be kept in line with accurate forecasts and a bit of technology. In my contract feeding career, I came in contact with many old school general managers with green columnar paper drawing manning charts for a bid response. The goal of the manning chart was to forecast labor cost at incremental population levels. Our contracts required a price chart based on the number of residents in the construction camp. For example, the increments would be 0-100, 101 to 2001, 201 to 300, etc. Our RFP response teams spent hours crunching numbers on their charts. The hourly wages needed to be increased by burden factors. Significant labor cost is included in the employer's share of pension investments, unemployment insurance, vacation and holiday pay, mandatory training, union dues and health care premiums. The burden expenses can raise the base pay labor expense by 20% or more. In the early 1980s, our ADP office in Denver offered a new management summary report. The management summary report is a straight forward matrix. Each row represents a summary by department. For example, we would create rows for Kitchen/Production, Dining Room and Bar Service, Housekeeping, Maintenance and Management. The columns recapped Regular Pay, Overtime Pay, FICA, LTD, Vacation Pay, Holiday Pay, Employer's FICA, FUTA and SUTA, Total Expense and Net Pay. This report could be used to make a journal entry since each row was a debit and each column a credit. More importantly, management could see the total cost for their department. Supporting schedules for each department have the same columns and the rows show the cost of each employee in the department. Since the report clearly showed the total hourly costs, our bid response team began to use the data and stripped their columnar sheets of all the payroll burden columns. They began to use the total cost per hour in the manning charts. This meant a lot less number crunching and we saved days previously spent in expensive hotels putting together our bid packages. As time went on, I was able to demonstrate the direct labor cost estimates the large cumbersome sheets determined could be reduced to a simple straight line formula. I used the increment midpoints and total column costs to construct a linear regression estimate. Initially, my new approach was trashed but my calculations were always very close to the numbers on the large spools of calculator tape. Eventually, I took over the bid team and we reduced the number of increments to 4. After determining the labor cost for these 4 operation levels, the linear regression estimates were used to fill in the price chart. We used the increments for the lowest increment (e.g. 0 to 100), the highest increment (e.g. 1,101 to 1,200) and the 2 increments which management believed would be the most active once the real job began. In the early 1990s, I found a terrific tool for creating employee schedules. The Scheduling Assistant from Guia International (www.workschedules.com), which is still available today, runs in Windows and is a easy to use once the setup is completed. Every employee is setup in the database. Key data includes all the identification information, the base pay rate, schedule constraints, position, department other data. My preference is to use total hourly pay costs with all burden included (including vacation and holiday pay accrual). Once the schedule loads, the forecaster simply draws lines with their mouse to create the schedule. As the lines are drawn, the program fills in hours and costs in the left columns. These individual numbers are recapped by day and week at the bottom of the chart. The program can use one schedule to create a new day of the week. Any adjustments are made and the whole week is saved. The scheduling tool can also be used to develop incremental staffing charts. The most important increments in many 7 day a week operations are Early Week (Monday and Tuesday), Mid-Week (Wednesday and Thursday), Weekend (Friday and Saturday) and Sunday/Holiday. Seasonal resorts should complete separate staffing chart decks for peak season and off season. Maximum staffing charts designed to handle major days like Mother's Day are helpful. These staffing chart totals can feed a linear regression formula to handle any sales forecast level. 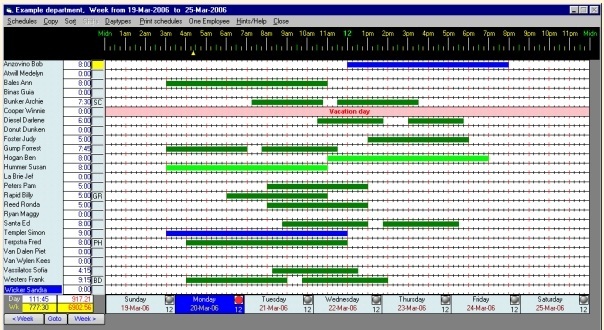 Proper use of labor scheduling charts makes direct cost control visual and precise. Combined with accurate forecasts of covers and sales, management will see a consistent labor cost with specific answers to variances.